Callum McManaman was sent off within 10 minutes of coming on as a substitute as Sheffield Wednesday inflicted Wigan's seventh defeat in nine outings. Wednesday striker Atdhe Nuhiu headed the winner from six yards eight minutes after the red, lifting his side 10th, while Wigan stay second from bottom. Wigan had gone close in the second half when Keiren Westwood saved from James McClean, who also had a goal ruled out. But McManaman lunged in on Claude Dielna and Nuhiu pounced to win it. It was the second sending off of 23-year-old McManaman's career and he could have little complaint after he left the ground to crash through Dielna with 22 minutes remaining. His side were looking to build on Boxing Day's win at Leeds to go two games unbeaten for the first time under Malky Mackay, who has overseen a dismal run of form since his appointment in November. The former Cardiff City manager has watched his side lose in five of his seven games in charge and though they went close to earning a point when Shaun Maloney hit the post late on, Wigan find themselves three points from safety. They started positively at the DW Stadium but Wednesday grew into the opening period and Ivan Ramis was forced to clear Nuhiu's close-range effort off the line. Lewis McGugan was a constant threat for Stuart Gray's side and struck from range to test Scott Carson, while at the other end, McClean pounced on Ben Watson's delivery to score after the break, only for the linesman's flag to cut short his celebration. Wednesday, the lowest scorers in the division before kick-off, shaded proceedings and though a stalemate looked likely, they took advantage of McManaman's recklessness. Despite being winless in 10 between late September and late November, they now enter the New Year comfortably in the top half of the table after a solid festive run of form. Nuhiu saw a header saved by Carson quickly after the dismissal but beat the Wigan keeper a minute later when he powered home Jeremy Helan's cross to secure Wednesday's fourth win in six matches. Wigan manager Malky Mackay on McManaman's sending off: "There's no issues at all, he hardly actually catches him but it's the fact it's two-footed at the ball. "It looks worse than it is - 90% of what he does is get the ball, but it's a sending off." Sheffield Wednesday boss Stuart Gray: "We played them not so long ago at our place and got the three points but last season we didn't take a point. "Last season we were unlucky not to get anything here, regarding the penalty miss and the keeper staying on the pitch. "I think the sending off was the right decision. The boy's off the ground with two feet and it's a dangerous tackle. That's obviously helped us, it opened the game up." Match ends, Wigan Athletic 0, Sheffield Wednesday 1. Second Half ends, Wigan Athletic 0, Sheffield Wednesday 1. 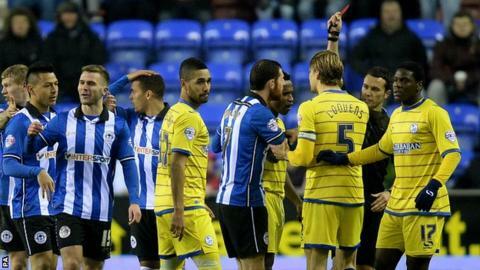 Atdhe Nuhiu (Sheffield Wednesday) is shown the yellow card. Attempt missed. Andrew Taylor (Wigan Athletic) header from the centre of the box misses to the left. Assisted by James Tavernier with a cross following a set piece situation. Shaun Maloney (Wigan Athletic) wins a free kick in the attacking half. Foul by Glenn Loovens (Sheffield Wednesday). Corner, Sheffield Wednesday. Conceded by James Perch. Jacques Maghoma (Sheffield Wednesday) wins a free kick on the right wing. Attempt missed. James McClean (Wigan Athletic) left footed shot from the centre of the box is high and wide to the right following a set piece situation. Iván Ramis (Wigan Athletic) hits the right post with a header from the centre of the box. Assisted by Shaun Maloney with a cross following a set piece situation. Chris Maguire (Sheffield Wednesday) is shown the yellow card for a bad foul. Andrew Taylor (Wigan Athletic) wins a free kick on the left wing. Foul by Chris Maguire (Sheffield Wednesday). Attempt missed. Chris Maguire (Sheffield Wednesday) right footed shot from the right side of the box is too high. Substitution, Wigan Athletic. Shaun Maloney replaces Rob Kiernan because of an injury. Iván Ramis (Wigan Athletic) wins a free kick in the defensive half. Substitution, Sheffield Wednesday. Kieran Lee replaces Lewis McGugan. Goal! Wigan Athletic 0, Sheffield Wednesday 1. Atdhe Nuhiu (Sheffield Wednesday) header from the centre of the box to the high centre of the goal. Corner, Sheffield Wednesday. Conceded by Scott Carson. Attempt saved. Atdhe Nuhiu (Sheffield Wednesday) header from the centre of the box is saved in the bottom right corner. Assisted by Chris Maguire with a cross. Corner, Sheffield Wednesday. Conceded by Andrew Taylor. Andrew Taylor (Wigan Athletic) wins a free kick in the defensive half. Josè Semedo (Sheffield Wednesday) is shown the yellow card. James McClean (Wigan Athletic) wins a free kick on the left wing. Foul by Josè Semedo (Sheffield Wednesday). Delay in match Claude Dielna (Sheffield Wednesday) because of an injury. Callum McManaman (Wigan Athletic) is shown the red card. Substitution, Wigan Athletic. Roger Espinoza replaces Ben Watson. Offside, Wigan Athletic. Ben Watson tries a through ball, but James McClean is caught offside.